I've forgotten the name of this place but it's a beautiful area of shopping malls, hotels and mansions surrounded by water. 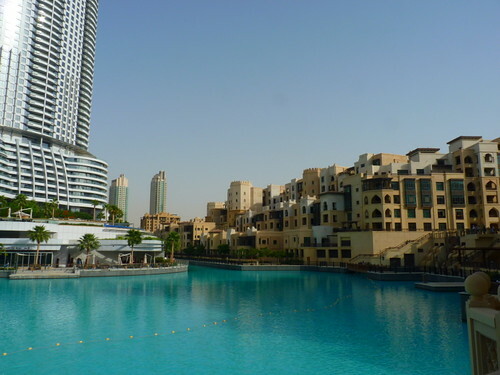 The weather in Dubai is hot (mid-30s C) but more pleasant than Malaysia because the humidity is low. We didn't sweat a drop despite being in the sun. Awesome. Some friends tell me they have no interest in places like Dubai which is all steel, concrete and artificial. I used to think the same until I went to Dubai and it changed my mind. For those who prefer Roman ruins, remember that the ruins were also artificial and man made. Ancient or new, these 'Babelic' structures attest to man's amazing capabilities and achievements. 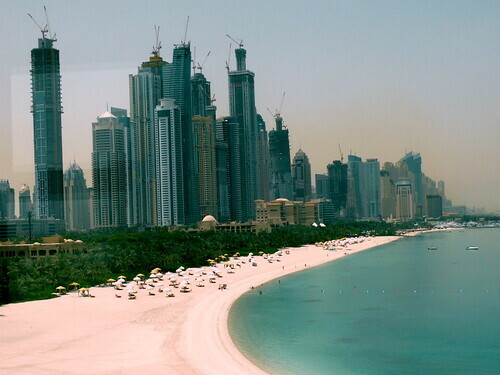 Palm Jumeirah is one of the three (I think) massive man-made islands being developed off the coast of Dubai. The islands are shaped like palm fronds and one of them is famously shaped like the map of the world. 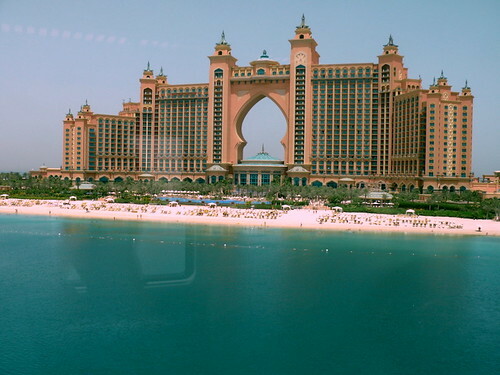 If I'm not wrong, Palm Jumeirah is the first island to be completed. The buildings are not just humongous, they are beautiful. 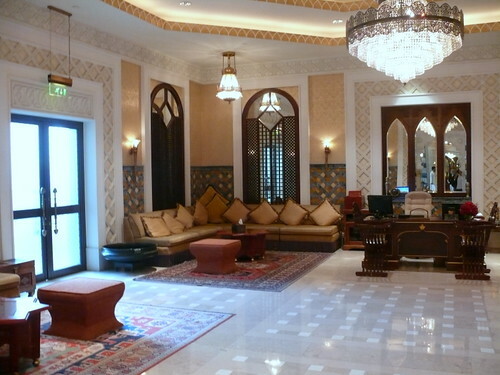 Every corner, every room, every balcony, every turn gives a picture-perfect view of Arabian decor and architecture. Our first stop in Palm Jumeirah was Atlantis which houses a 6-star hotel, aquarium, water theme park and high end shops and restaurants, including Nobu. You have to pay Dh25/RM20/US$6 to get in and that allows you into the complex and see only one aquarium. The decor of the aquariums is the mythical city of Altlantis. 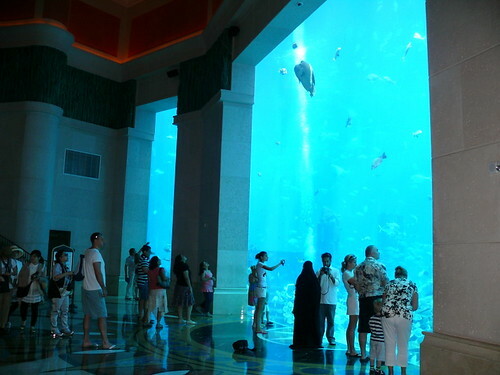 To see all 22 aquariums, you need to pay Dh100. 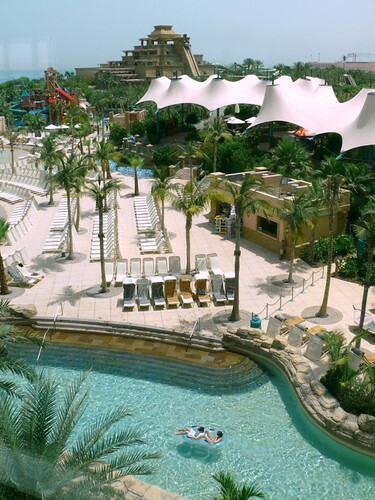 We skipped that, and took the train ride around the Palm, Dh15 per pax one way to the exit. 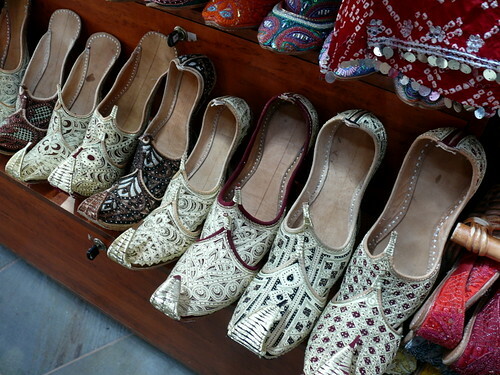 We found entrance fees in Dubai very reasonable except for Burj Al Arab. Miles and miles of beautiful mansions are built along the fronds, giving each house a private beach. It truly is amazing, the scale of the development in this desert. I found myself asking if I was on earth or somewhere else. 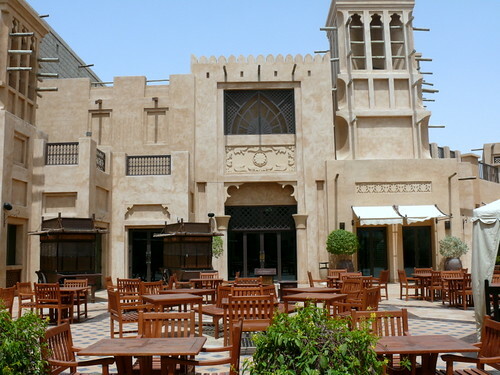 Because the Burj Al Arab charges an entrance fee of US$100 (which can be redeemed for food or shopping), we decided to dine nearby at the Madinat Jumeirah, one of the two 5 or 6-stars hotels in Palm Jumeirah, which gives a good view of Burj Al Arab. I found the whole Palm Jumeirah complex just as amazing as the Burj Al Arab anyway. The following photos don't give justice to the Madinat Jumeirah; you just have to be there to feel the wonder of the place. 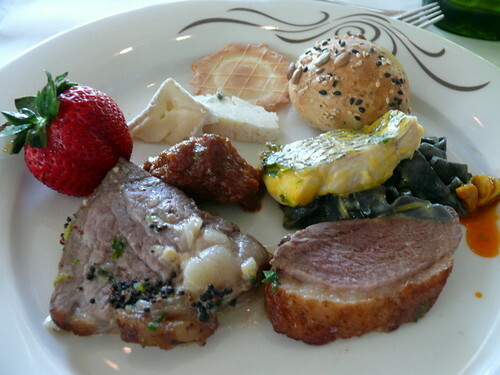 The lunch buffet (Dh150/RM120/US$36 per person, I think) was scrumptious. 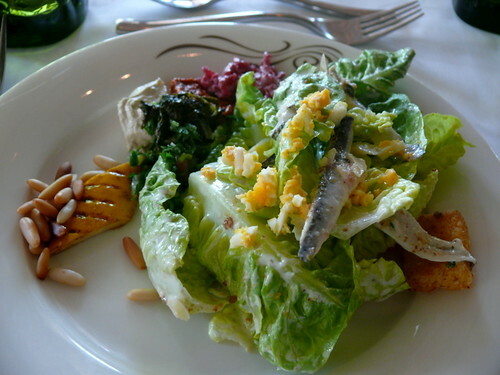 I started with a Caesar salad made to my order, topped with white anchovies and Himalayan pink salt. It was the best Caesar salad I've ever had. 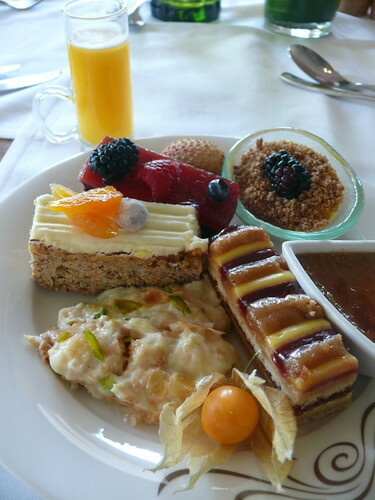 Yes, I ate all the above and got very sick. 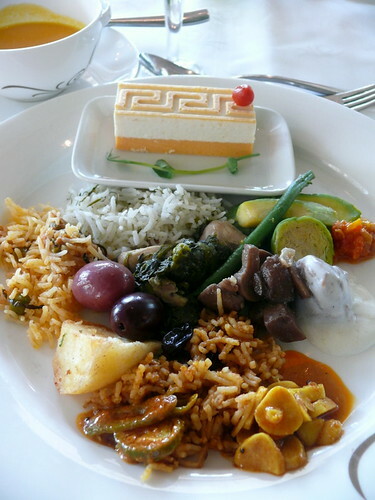 I stumbled out of the hotel's restaurant, giddy, nauseous and full of regret for over eating. On the way home, we passed by the old quarters of Bastakiya and it turned out to be abandoned, so don't go there. 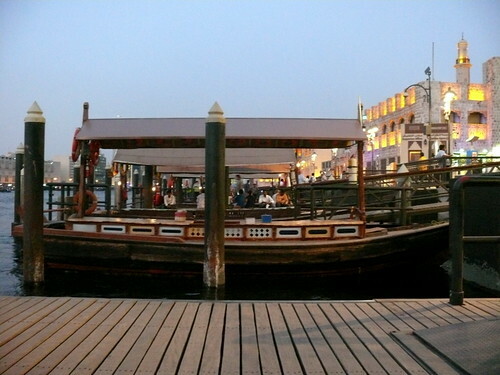 We went to creek point in Bur Dubai, where textiles and Arabian hand-made shoes are sold, and got on an abra (a wooden dubai boat) which crossed the Dubai Creek in 5 minutes to the Diera City Centre for only Dh1! 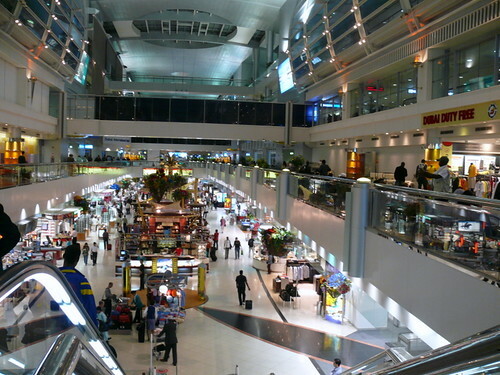 There's so much publicity about Duabi's airport and here it is. I wasn't impressed but that was before I saw Heathrow. After Dubai, London was downright disappointing. p.s. when in Dubai, take the metro. It is cheaper than taxi, gets you to many destinations and is easy to use. And the bonus is it's super sleek and clean. Get a metro card for Dh20 (Dh6 is deposit for the card which you get back when you return the card) only which can last you 3 days or more. I was disinterested in Dubai as well, now you have convinced me otherwise. Will mortgage stuff right away & Dubai here we come... very tempting indeed! Wow! It's beautiful! Great photos! Love all your photos, Terri! I've never considered Dubai but after reading your post, it's definitely on my Places To Go list. 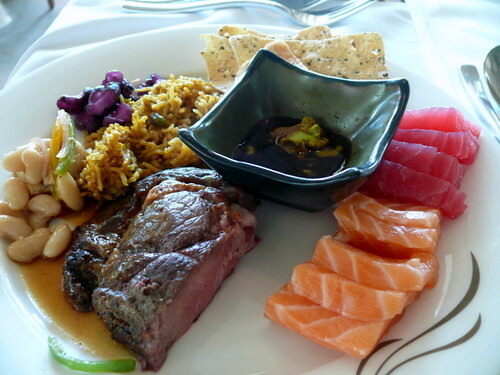 Terri for you to state that a particular dish is the best you have ever tried must mean it is truly sensational. And thanks for making Dubai look great! A place I've always wanted to visit. Lovely pixs but would be too hot for hubs. He is an "English rose". mike: dubai's good as a transit stop. no need to mortgage stuff, just leave wife n kids at home! 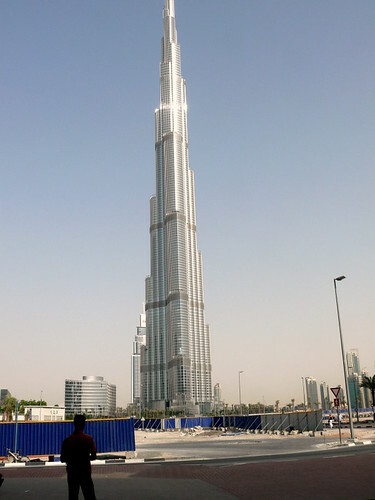 kidding--dubai's great for older kids like yours who can appreciate the buiildings and still enjoy the theme parks. btw, don't begrudge me my holiday. i've not been to europe b4 but you've here many times. n hub is a workaholic anyway, so serves him right to hav to go back to earn more $! applegal: you don't know how many times i kicked myself for not getting a DSLR or at least bring my daughter's, esp at night when my camera becomes useless. ccc: er, don't hav too high expectaions n u won't be disappointed. feedme: i was hungry too shan! but it was good, tt salad. tina: haha. he'll melt in the sun. like me. again, your commentary and photos are inspiring. i have always wanted to go there and now i am even more inspired. i think it is an easy stop-over to go to the US form here so i will look into it for my next trip home. if so, i will surely use your travel advice when there.